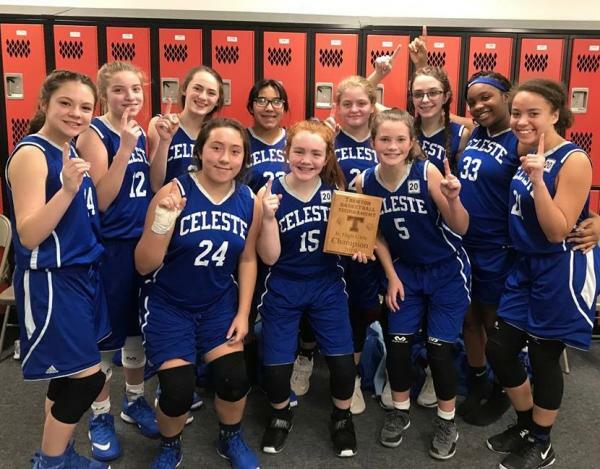 The Celeste Junior High girls’ basketball team placed 1st in the Trenton Junior High Basketball Tournament. Celeste beat Wolfe City 30-3 and then defeated Trenton 33-19 to win the championship. Aaron Butler ranked 1st in the 114 weight class, Brady Henslee; 2nd in 181 weight class, Bryce Jurca; 2nd in the 165 weight class, Tanner Smith; 2nd in the 242 weight class, and Keeley Jurca ranked 1st in the 105 weight class and she received the outstanding lifter award for the lightweight division.